Mike Rowe, the host of Dirty Jobs, has decided to give one lucky dirty jobs enthusiast a chance to host a few episodes of the show. Our favorite Bible scholar, Dr. Barry Oldman, decided to audition for the part. As an archaeologist, someone who specializes in spending a lot of time in the dirt, he thought his chances for landing the role would be pretty high. He did his best to show Mike Rowe how dirty he could get. But he might have gone a little too far in his audition… will we be seeing Dr. Oldman as the host on the next episode of Dirty Jobs? Dr. Oldman got the job! But, his first job ended up being the exact opposite of dirty. Germs are pretty dirty… but they aren’t the kind of dirty that is going to show up on camera. The red pills in the pharmacy did remind Dr. Oldman of one of the most unforgettable stories in the Bible – when God rescued the Israelites from the Egyptians by parting the Red Sea. 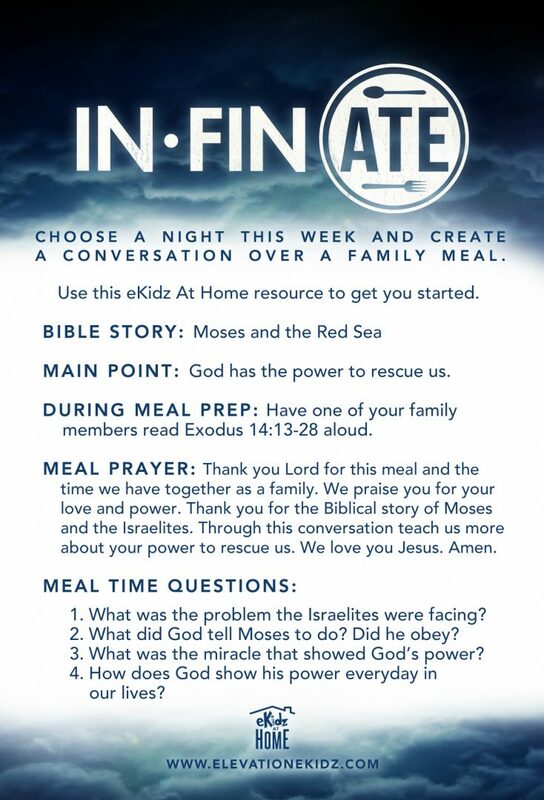 Use the In-Fin-Ate Card you received on the way out of eKidz to continue the conversation with your family about Moses and the Red Sea. CLICK HERE for the Motion Weekend-Wrap Up.